Nissan said the five-seater hatchback was rated with a driving range of 200 km (124 miles) on a full charge under Japanese test standards, more than the 160 km (100 miles) advertised under California's rules and 73 miles under the U.S. Environmental Protection Agency's reading. To address "range anxiety," Nissan said it had installed normal charging spots at about 2,200 dealers around Japan, and quick chargers in about 200 dealers capable of recharging to 80 percent of the batteries' full capacity in 30 minutes. "We believe this is the start of a new era for the auto industry," Chief Operating Officer Toshiyuki Shiga said. Delivery will start in Japan and select U.S. states this month, followed by the first European markets in January. Nissan has filled the maximum initial orders for 6,000 Leafs in Japan, and 20,000 units in the United States, set to reach customers over the next year or so. Nissan is not the first major automaker to sell an electric car. That honor belongs to Mitsubishi Motors Corp, which launched the smaller i-MiEV electric car last year, first to fleet customers and then to individuals this April. But Nissan and its French partner, Renault SA, are aiming to be the top sellers in the nascent electric car market, which the alliance expects to make up 10 percent of new vehicle sales globally by 2020. Renault and Nissan have earmarked 4 billion euros, or $5 billion, over the next few years to mass-produce electric vehicles and the batteries that power them. By 2013, the alliance will have the capacity to produce 500,000 batteries, some of which will be used for hybrid models. 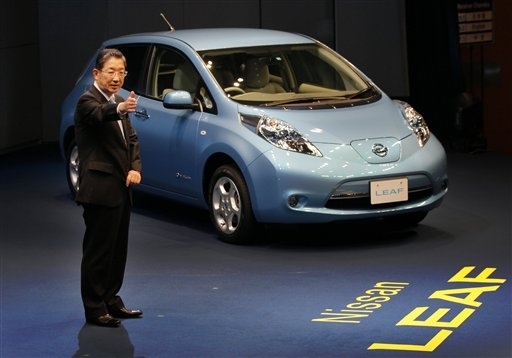 Until production of the Leaf begins in the United States at the end of 2012, and in Britain after that, output of the Leaf would be limited to 50,000 units a year, Shiga said. Production of Mitsubishi Motors' i-MiEV, meanwhile, hit a cumulative 5,000 units last month after sales began in July 2009. Nissan gave the Leaf a suggested retail price of 3.76 million yen ($44,900), which will fall to 2.98 million yen in Japan after the government's electric vehicle subsidies. Those subsidies are applicable only until the end of Japan's fiscal year, on March 31. The government has yet to announce its incentive policy beyond that date. Electric cars that run on batteries have come and gone since the early 1800s, but their limited power and range have made them impractical for the modern age. As automakers, including Volkswagen AG and Toyota Motor Corp, roll out their electric vehicles (EVs) in the coming years, they will need to educate consumers to quash any misconceptions and prepare them for features unique to EVs. At the launch, Nissan showed video images of the Leaf undergoing vigorous tests, including being struck by an artificial lightning bolt in a lab, and emerging unharmed from flooded waters that came up to its headlights. An electric plug was shown being inserted into the Leaf's socket as water from a hose gushed onto the plug. Nissan is taking extra precautions by putting would-be buyers of the Leaf through a vetting process to make sure they are the right fit for an EV. That means anyone driving more than 100 miles a day regularly would be steered to one of its gasoline or diesel cars. In some markets, Nissan will give customers with occasional long-distance driving needs an option to rent a conventional car at a low price for seven days during the year. Nissan is also waiting to sell electric cars in regions with extreme hot or cold climates until it can better educate consumers on how best to avoid unnecessary wear on the batteries. While most major automakers have plans to develop EVs, General Motors and Toyota are looking to compete against the Leaf with plug-in hybrid cars, which can run both in EV mode and on gasoline. GM will begin selling its Chevy Volt in the United States this month, while Toyota's plug-in hybrid is due by 2012.